It’s not hard to guess that Iceland is icy. The clue, after all, is in the name. But guessing the age of Iceland’s ice is more challenging. Let’s phone a friend for some help. Wikipedia tells us Vatnajökull experienced “subglacial eruptions” during the “last ice age”. Vatnajökull, also known as the Water Glacier in English, is the largest and most voluminous ice cap in Iceland, and one of the largest in area in Europe. It is located in the south-east of the island, covering more than 9% of the country. The average thickness of the ice is 400 m (1,300 ft), with a maximum thickness of 1,000 m (3,300 ft). Under the ice cap, as under many of the glaciers of Iceland, there are several volcanoes. Eruptions from these volcanoes have led to the development of large pockets of water beneath the ice, which may burst the weakened ice and cause a jökulhlaup (glacial lake outburst flood). Wikipedia implies the Vatnajökull ice is probably between 115,000 and 11,700 years old. The last glacial period occurred from the end of the Eemian interglacial to the end of the Younger Dryas, encompassing the period c. 115,000 – c. 11,700 years ago. However, given Wikipedia’s source it’s probably best to get a second opinion. 2. Scheffel, Richard L.; Wernet, Susan J., eds. (1980). United States of America: Reader’s Digest Association, Inc.
Back in 1978 the intrepid Willi Dansgaard [and others] reported a “simple ice-flow model” indicated “an age of 1,400 years at the bottom” of the Vatnajökull Ice Cap. Let’s go for a third opinion. 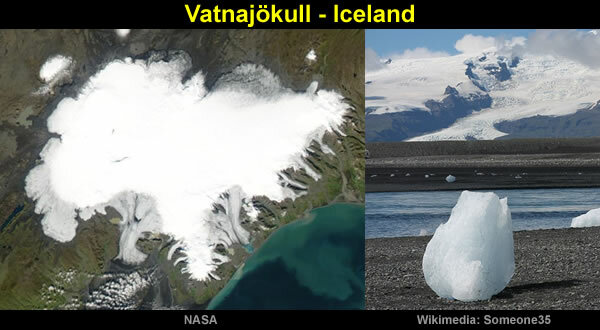 The third opinion suggests the Vatnajökull Ice Cap is about 1,100 years old. Bárðarbunga is a subglacial stratovolcano located under the ice cap of Vatnajökull glacier within the Vatnajökull National Park in Iceland. The caldera is about 80 square kilometres, up to 10 km wide and about 700 metres (2,300 ft) deep. The volcano is covered in ice to a depth of 850m, hiding the glacier-filled crater. Let’s double check using another lump of ice in Iceland. The results from Hofsjökull also suggest the ice is somewhere in the region of 1,100 years old. Hofsjökull is the third largest glacier in Iceland after Vatnajökull and Langjökull and the largest active volcano in the country. It covers an area of 925 km2, reaching 1,765 m (5,791 ft) at its summit. The subglacial volcano is a shield type with caldera. 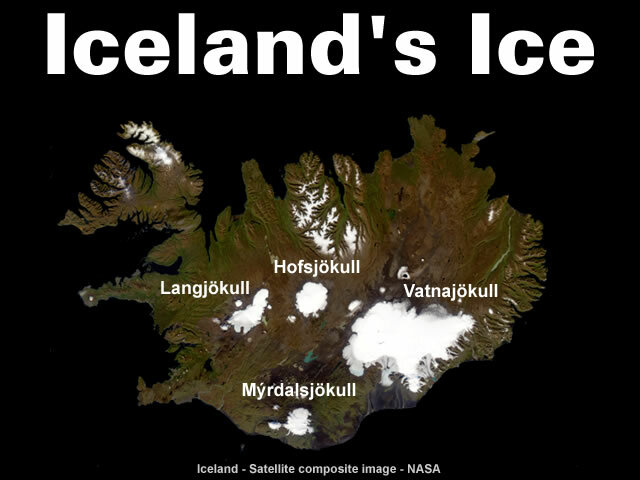 Overall, the models suggest Iceland’s ice is somewhere between 1,100 and 1,400 years old. 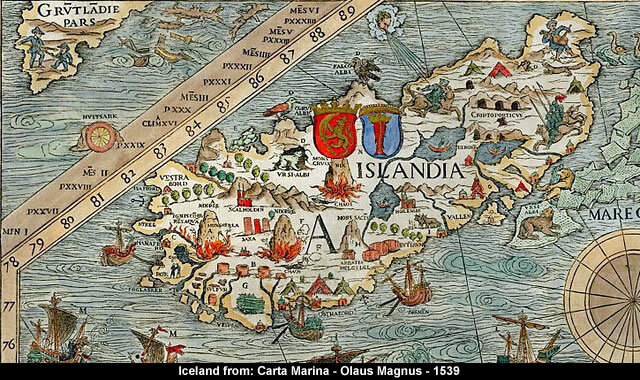 The formation of Iceland’s ice appears to be associated with events surrounding the Arabian Horizon [centred 637 CE] and the Heinsohn Horizon [centred 912 CE]. These results also suggest the origins of the Carta Marina date back to the 1st millennium. So it’s not really surprising Roman coins are found in Iceland. Islam’s Chronology: Were Arabs Really Ignorant of Coinage and Writing for 700 Years? But, as always, readers are encouraged to review the evidence before making their own guesses. Gallery | This entry was posted in Arabian Horizon, Glaciology, Heinsohn Horizon, History, Iceland, Old Japanese Cedar Tree, Roman Chronology. Bookmark the permalink. Bravo! And, as the U.S. celebrates its annual holiday of Thanksgiving, I am thankful that Tim Cullen created MalagaBay, and grateful for all the gems found therein.